Glass stoppers and perfume bottles go hand in hand when it comes to these vintage vessels of intricate beauty. The practice of bottling scents has a long history - ancient Egyptians created fragrances and bottled them in clay and alabaster containers. Glass bottles of | perfume date back to as early as the fifteenth century, and despite attempts at using other materials, such as porcelain, to hold perfume, glass has proven to be the best material to house scents. While not many glass perfume bottles survive from the earliest centuries, the few that do provide evidence of fine craftsmanship. Antique glass perfume bottles are considered works of art, and many people enjoy displaying or using the perfume bottles. Collecting vintage fragrance bottles became popular starting in the 19th century. There is a great variation in the styles of glass bottles and stoppers, and before mass production of perfumes and bottles, they were handmade, rendering them very special, and often quite valuable. Both the vessel itself and the glass stoppers perfume bottles were topped with are visual delights, often in unique shapes or intricate designs. When perfume bottle began being commercially produced, stoppers were still designed with a careful eye, since the glass stoppers play a substantial role in the perfume bottle design itself. An important visual enticement in the original purchasing of a bottle, the stopper is a large part of the appeal for collectors to showcase. Glass stoppers are also sold separately from the bottles (often in assorted lots) and can be used as replacement stoppers or to display alone. 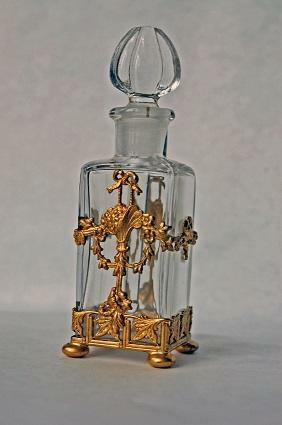 Some individuals also use decorative glass perfume stoppers for other purposes, such as a decanter topper. Stoppers may have long or short daubers. Some older styles simply set in alignment with the bottle, while other styles turn to securely fit in the neck of the bottle. Figural Stoppers: Renditions of human figures, including male and female figures, heads, clowns, cherubs, and dancers. Nature Inspired Stoppers: Elegant floral stoppers, shell stoppers, trees, stars and starbursts, as well as others. Shaped Stoppers: Triangles, gem inspired toppers, rounds, squares, prism style stoppers and various other shapes. Insect and Animal Toppers: Many variations in these toppers, from butterflies for elephants. Both the style and type of glass (for example pressed or blown) also vary depending on the period. Glass stoppers were originally designed to be removed and used as a dauber or dabber to lightly apply the perfume. Today many modern perfumes use an atomizer designed to spritz or spray scents on. Modern toppers are often made from metals or are polymer based. Rather than a stopper, most modern perfumes use a glass topper to enclose the spritzer base. The allure of beautiful handmade glass stoppers for perfume has been revived in contemporary times, and many glass artisans now create original pieces. These vary in cost and style depending on the particular artisan. Naturally great care needs to be taken if removing an aged stopper from a perfume bottle. Too much force and twisting can result in breakage of the stopper, which can be cumbersome to repair and may need the talents of an antique glass repair specialist. If an intact stopper is stuck, one method is to form a small reservoir around the area where the stopper meets the bottle and place a small amount of clear oil (such as baby oil) in the reservoir. Allow the oil to set in the area for several hours before attempting to gently pull it out. Use a clean cloth to grip the stopper when attempting to gently remove. While some perfume bottle owners have had success using warm water on the bottle base and cool water on the stopper to remove it, this can be tricky as the changing water temperatures may be too harsh for some bottles and can crack or damage the glass, this method should only be used with great caution and may not be best for very old bottles.